Top food stylist and Food52’s popular baking columnist shares her baking secrets. 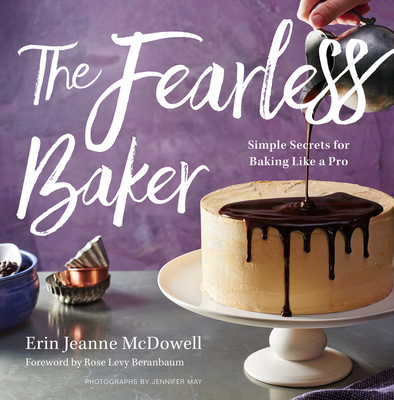 When people see Erin McDowell frost a perfect layer cake, weave a lattice pie crust, or pull a rich loaf of brioche from the oven, they often act as though she’s performed culinary magic. “I’m not a baker,” they tell her. But in fact, expert baking is not at all unattainable, nor is it as inflexible as most people assume. The key to freedom is to understand the principles behind how ingredients interact and how classic methods work. Once these concepts are mastered, favorite recipes can be altered and personalized almost endlessly. With the assurance born out of years of experience, McDowell shares insider tips and techniques that make desserts taste as good as they look. With recipes from flourless cocoa cookies and strawberry-filled popovers (easy), through apple cider pie and black-bottom crème brûlée (medium), to a statuesque layer cake crowned with caramelized popcorn (difficult), and “Why It Works,” “Pro Tip,” and make-ahead sidebars with each recipe, this exciting, carefully curated collection will appeal to beginning and experienced bakers alike. ERIN MCDOWELL writes a biweekly baking column for Food52, where she is a Baking Consultant at Large. She is the recipe editor for PureWow and a food stylist for Sift. She has styled desserts for more than sixty cookbooks and dozens of magazine and newspaper articles, as well as for billboard and TV ads. She lives in North Bergen, New Jersey. "In her first cookbook, McDowell, a baking columnist for Food52, endeavors to make baking easier and more understandable for home cooks. She distills the professional tips she’s learned over the years and offers advice that both new and experienced bakers will find indispensable. Her recipes run the gamut from simple chocolate chip cookies to the more involved chocolate palmiers, made with home puff pastry, and chocolate cream pie with whipped peanut butter cream. Her sense of fun is felt throughout the book with recipes such as PB&J Whoopie Pies and caramel corn layer cake. She adds twists to recipes to make them her own, such as with salted caramel-swirled meringues; grapefruit meringue pie; and raspberry-ripple crunch bars, an innovation that she explains came to her in a dream. Comprehensive tips on baking and decorating cakes and pies accompany tempting recipes, including for pound cupcakes made with honey-caramel glaze, mocha cake with a coffee and white chocolate ganache, and a simple cider caramel apple pie. Her clearly written recipes and tips, explained in a friendly, encouraging voice, will inspire confidence in experienced and novice bakers alike.